Window Cleaning ArticlesComments Off on Pure Water Window Cleaning: How It Works? So what makes pure water systems so special? Pure water is just that, pure, there are no added salts or dissolved solids present in the water. TDS, otherwise known as “total dissolved solids” is the measure for water purity. The more solid particles or minerals in the water, the higher the TDS number. The number will start from zero, zero being optimum purity. Th number represents how many foreign parts per million (ppm) the water contains. For example, the World Health Organisation discovered that natural sources of water can read a TDS number that widely varies from less than 30 ppm up to 6000 ppm. To measure the water your commercial window cleaner should have a TDS device that reads the purity levels of the water they are using – but what it effectively does is test the electrical conductivity of the water and pure water should have absolutely no indication of electrical conductivity in its reading. The industry recommends that in pure water there should be zero parts per million if you want to achieve outstanding results on your windows. It sounds strict but the probability of achieving this is extremely high if you work with good and complex water purification tools. There is no use of detergents or chemicals so is 100% safe for your commercial premises. It is kind to the environment, due to the water being pure and there being no use of chemicals it will not have any effect on the environment surrounding use. The process of the window cleaning will leave your windows clean and no spots or residue. Using pure water systems is worth every penny because it will increase the longevity of the cleanliness of your windows. 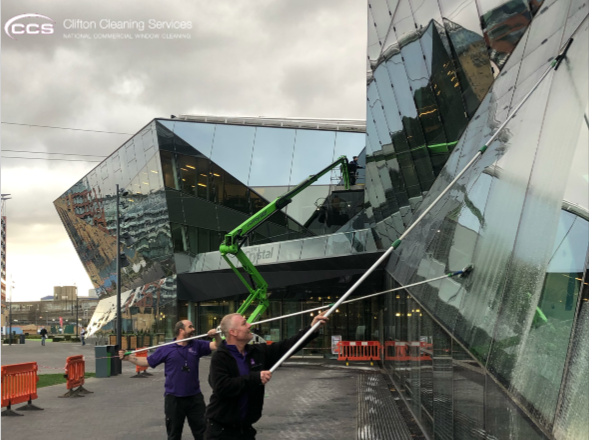 At Clifton National Window Cleaning we are constantly improving and developing our high standards of cleanliness and appearance, without raising our prices. The amazing developments in window cleaning technology such as the use of heated, purified water to achieve a better finish, also us to make sure we offer the very best quality finish for our clients. « Spring Is Coming – 3 Reasons To Choose Clifton!